It’s Mother’s Day weekend and we wanted to celebrate by featuring some feline mamas who show us all what the love of a mother is about! Here are 3 stories that show the incredible love of a any mother for her children, even if they are her adopted children. So if you’re a mom, do motherly duties, or care for somone in a montherly way, regardless of gender or species, this is for you! Masha is a homeless cat that takes shelter in the stairwell of an apartment building during the colder, winter months in Obninsk, Russia. One particularly cold night she was heard meowing loudly, which is not normal. Realizing something must be wrong; one of the tenants came to check on her. An abandoned infant was discovered in a box that is usually reserved for Masha. The motherly feline was curled up with him, shielding him from below freezing temperatures. Masha seemed to take an instant liking to the baby but she also seemed to know she could not give the baby proper care and that’s when she began to call for help by meowing. The infant was discovered and taken to the hospital. Thanks to Masha he was found to be in perfect condition. Masha, however, was bothered that her new human baby was taken from her. She tried to get into the ambulance and remained in the street for hours, distressed and possibly waiting his return. Masha has a special place in the hearts of all the apartment residents, who continue to thank her for her heroic deed with milk and treats. They also attribute the child’s well being to Masha and she will forever have their gratitude. Apparently this has happened before in 2006, in Cologne, Germany. An infant was left on the doorstep of a home, in freezing temperatures. The cat was lying with the baby and meowing persistently until the homeowners opened the door to see what was distressing the cat. They found a baby who was just beginning to show signs of hypothermia. Mikey, an 8-month-old rescue cat was originally thought to be male, but when taken to the vet to get neutered they discovered that she was not only a she but that she was pregnant. Sadly her premature litter of 3 did not survive. They passed away one by one. Mikey was inconsolable. She was depressed and seemed to be searching for her offspring. Her rescuer Hillary felt her grief and was willing to do anything she could to help Mikey. She called the local cat rescue, Dori’s Darlings and coincidentally, they just received 3 rescue kittens that were only a few days old with umbilical cords still attached. The following day the kittens were introduced to Mikey . She took to them quickly. She immediately started bathing and cuddling them. Within 15 minutes she rolled over to see if they were hungry and they were. The kittens instantly took to Mikey as their mother, they even look like her! In 1996, The New York City, Fire Department showed up to a burning building in Brooklyn, New York to put out a fire. As soon as they had the blaze under control one of the men, David Gianelli, noticed 5 slightly singed kittens near by and after searching located their barely recognizable feral mother. By the looks of it, he realized, the hero momma cat must have walked in and out of the burning building 5 times in order to carry each kitten to safety. Her eyes were blistered shut; her pads were badly burned along with much of her face and body. The compassionate firefighter placed the entire family inside of a box and watched the mother, touch her nose to each kitten, to assure all were accounted for. She then collapsed. Firefighter, David Gianelli, raced the entire family to the North Shore Animal League in Port Washington, New York. The mama feline and 4 of the kittens eventually recovered, and found forever homes. The hospital received over 7000 letters from people offering to adopt the entire family. In the end they decided it was best to split the family of 5 into 3 forever homes. The mother was named Scarlett and spent the rest of her life in total comfort. The North Shore Animal League created an animal award for heroism, titled the Scarlett Award. Happy Mothers Day to all the mothers and motherly types out there. 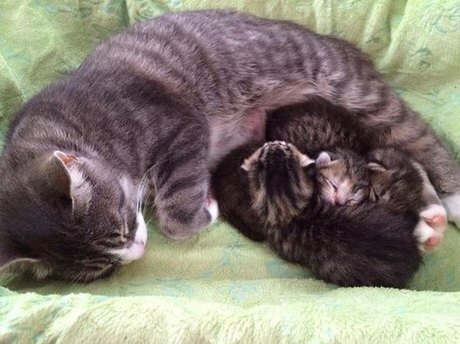 Here are 25 kitty cat moms and their happy babies to make you smile!